With the launch of the new ZI website, the old ZI website was moved to http://thesiteformerlyknownas.zachtronicsindustries.com (where you are right now). 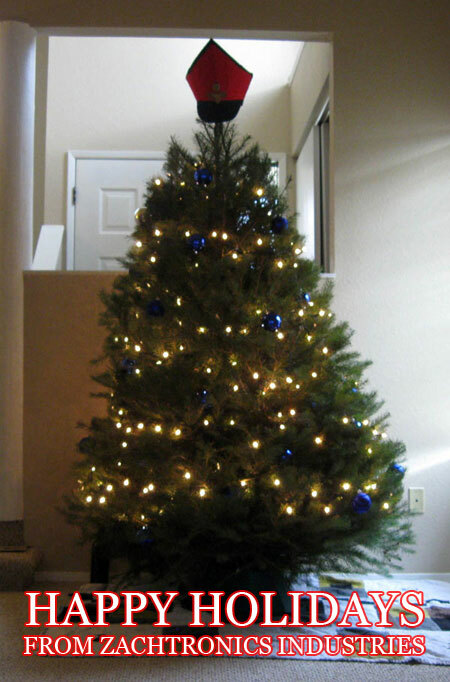 Comments are disabled and there will be no new posts. Unless you are looking for strange, old Zachtronics Industries stuff, you probably want to visit http://thesiteformerlyknownas.zachtronicsindustries.com instead! – As payjack points out, this game looks an awful lot like a real indie game, which I assume means you suspect that it will cost money. Which would be the correct thing to assume! While we’re not 100% sure on the price point at the moment, it will definitely be available sometime in the next few months, on some sort of digital distribution platform and/or for purchase on my site, for Windows, Mac, and Linux. – Okay, so maybe this isn’t a question, but as we get closer to launch I’ll be counting on you, my dependable Extreme Fans, to let the rest of the world know about SpaceChem. You can start by joining the mailing list and/or following the SpaceChem twitter (@spacechemgame) so that you hear all the latest news as it becomes available. – Unfortunately, I do not think that SpaceChem’s physics implementation will be powerful enough to support self-interpreters. Don’t let that get you down, though, as the game is puzzling enough despite limited molecular interactions! If you have anything else you’re dying to know about SpaceChem (or Zachtronics Industries, or anything else) feel free to ask in the comments. Welcome to the future of Zachtronics Industries! I got an email this morning from a fan of a new-ish flash engineering game, Tile Factory, suggesting I tell you guys about it. 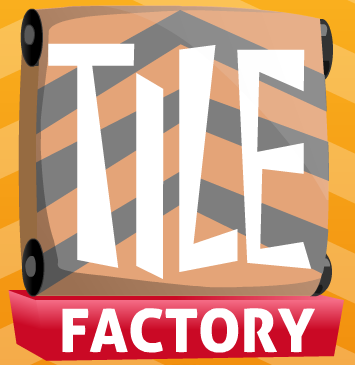 Tile Factory is an engineering game by Jonathon Duerig that involves factories and tiles. From what I’ve played the gameplay feels like a mix of Manufactoid and Factory Balls, but without the Lua of Manufactoid or the random trial and error of Factory Balls. That’s a compliment, by the way. You can play the game on Kongregate and then, once you’re hooked, find a lot of user created levels here. Who here likes my “engineering” games? Everyone? Excellent! Because I have something that you may like! GO PLAY THIS GAME. RIGHT NOW. And then go vote for it with 5-stars because this fellow is close to winning the weekly prize! What is this? It’s a flash game called Manufactoid Manufactoria by a Nicholas Feinberg of mysterious origins. 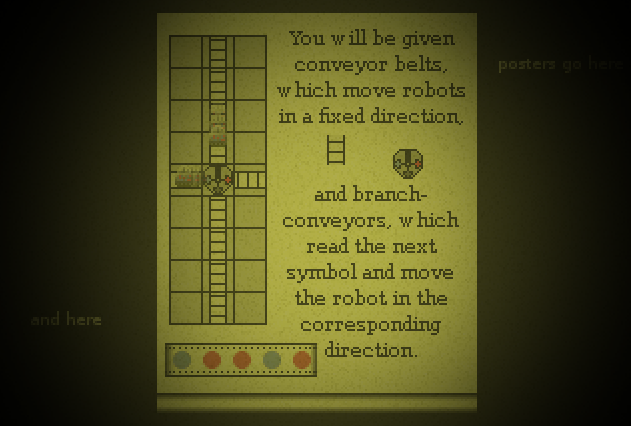 And it’s a proper game for engineers, about nothing less than finite state machines (and possibly more complex computational machines, as I haven’t beaten the game yet) in the guise of robot testing equipment. It even has charming flavor text and auto-save. Why are you still reading this? Go play this game! EDIT: Yup, I see something that looks like a Turing machine. Incredible! Although it appears to have gone over some heads, the last post, Internal Developments, was intended as satire. Perhaps not enough of you have experience in production environments where XML is used like a glorious aether that ties everything together. Fortunately, I think we can spin this into something more informative. As it turns out, I didn’t even write that abomination, nor the cryptic “release memo” that accompanied it. It was written by my friend and colleague Keith, who also wrote the prototypes for the shaders in Infiniminer and may be collaborating with Zachtronics Industries in the near future. Consider him the Senior Protocol Architect for Asset Interchange Formats. The Advanced Graphics Laboratory, a division of Zachtronics Industries, is pleased to announce that a recently developed internal tool has been approved for release to the public! This is a very exciting time for the Advanced Graphics Lab, as this marks the first public release of an internal tool from our lab. We at the laboratory hope that you, loyal ZI consumer, can apply this compelling new standards-based technology to your own problems with as much success as we have here in the lab.